That’s why today, we’re here to recognise the Top Mechanics in Canberra. In 2018, AutoGuru partner mechanics in Canberra quoted over $2 million worth of services and repairs for AutoGuru customers, to help them better care for their cars. We’re here to recognise the Top Mechanics In Canberra, who went above and beyond to consistently deliver amazing service experiences to their customers. Goodyear Autocare Fyshwick will take care of your whole vehicle, from tyres to all your mechanical needs: brakes, suspension & 4wd. Opposite Bunnings Fyshwick, close to Manuka, Kingston, Narrabundah, Barton & Canberra airport, they are apart of the Goodyear Autocare Franchise Program. Troy and the team have been in operation for over 6 years, and with 7 service bays, they ready and capable to help you out with all your mechanical needs! With a 4.6 rating on AutoGuru, you know that customers have been more than happy with their service experiences, check out this review! 5A Mechanical Repairs are a team of professional auto mechanics, dedicated to providing exceptional mechanic services throughout Fyshwick, Canberra and South ACT. At 5A Mechanical Repairs they know how precious your car is to you, which is why they treat it with only the utmost respect. You can rest assured that with their team, your car will be in the most trustworthy hands. Mario and the team offer auto repair and maintenance services for air conditioners, batteries, suspension and radiators, as well as engine repairs, car servicing, diagnostic testing and more! They have a 4.6 star rating on AutoGuru, have a read of one of their great reviews. If you’re after mechanical servicing and repairs, Michael and the crew at DTM can help you out! They can do everything from log book Servicing, tyres, brakes, radiators, clutches, batteries etc, motor rebuilds or installs, all done by our professional qualified mechanics. If you’re after electrical work, they’ve got an Auto Electrician available for all your diagnostics and repair needs. Throughout their 8 years of operation, Dyno Tune Mitchell pride themselves on their honest and reliable work ethic across all automotive services. They’ve got a great 4.8 star rating on AutoGuru, with customer leaving some great reviews! 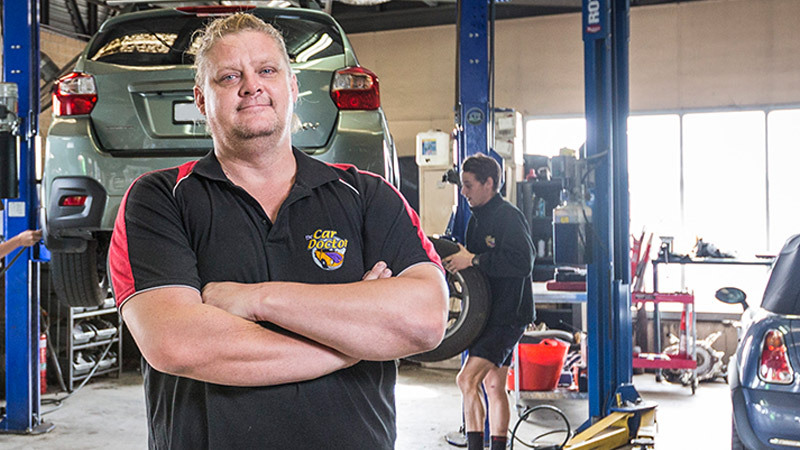 Glenn and the team at Ultra Tune Tuggeranong are a dedicated team focused on customer service and satisfaction. They’re led by a proud female owner who has a passion for looking after her customers needs and wants. Ultra Tune Tuggeranong is always there to help! They can cater for all your vehicle's needs, and with over 30 years of experience, you can safely say you and your vehicle are in good hands. Check out this review from a happy customer. It’s a one stop automotive workshop at Ultra Tune Phillip! Jack and the team are aiming to deliver the best service possible to their customers as well as their beloved car. They only use quality parts to ensure your vehicle is in great condition once they have completed their work. Ultra Tune Phillip uses recommended products such as Castrol oil and Ryco filters. They can service all makes and models, however they specialise in BMW, VW and Audi. Ultra Tune Phillip has a 4.6 star rating on AutoGuru, check out what this customer had to say! Ultra-Tune Belconnen are a trusted name in Canberra’s automotive industry. They aim to deliver the best quality outcomes for customers and their vehicles, offering a hand-picked team of qualified technicians that carry out servicing and repairs on all vehicle makes and models. Owner Phil Staines and the team know their cars! They are knowledgeable and efficient, giving their customers peace of mind and helping them save money. Ultra-Tune Belconnen specialise in BMW, VW and Audi brands, and every maintenance service comes with a nationwide 6-month free roadside assistance. Marcus and the team at GenTech have over 120 years combined experience and are dedicated to achieving the most from your vehicle! GenTech cater to all your general mechanical needs from a warranty book service right through to a high performance upgrades and diesel tunes, cold air intakes, LS1 Edit, stroker engines, full exhaust systems, diff ratio changes and brake and suspension upgrades. They’ve been in operation for over 18 years, and with 8 service bays, they’re ready to help you out with all your automotive needs. The crew have earned themselves a perfect 5 star rating on AutoGuru, here’s what one happy customer had to say. Goodyear Gungahlin specialise in all automotive services, including log book servicing and major repairs. They’re a certified ACT rego inspection station and can also supply all models of tyres, along with conducting wheel alignments. Matt and the team have been in operation at this location for over 15 years. They’ve got 4 service bays ready to take on any job, and with a 4.7 star rating on AutoGuru, we can tell they’re delivering a great service experience. When it comes to brakes, clutches and automotive services, ACT Brakes and Automotive in Canberra is the place to go! They offer their customers quality advice using their entire teams extensive experience and industry knowledge, and after being in operation for over 52 years, we reckon they know what they’re talking about. They’re a locally owned, family run workshop and are also the largest brake and clutch specialists in Canberra. Colin and the team have got an awesome 5 star rating on AutoGuru, so you know your vehicles in safe hands with them. Looking for a mechanic in Canberra?